The American people’s top policy priorities for 2014 are strengthening the economy and improving the jobs situation, according to a new Pew Research Center report. Those have also been the top priorities each of the last five years, and no wonder: Between December 2012 and December 2013 (the most recent data available), U.S. payrolls grew by just 1.6%, the latest entry in more than a decade of weak jobs growth. Though the unemployment rate is based on a survey of households, economists tend to give more weight to payroll jobs, which are reported by employers. 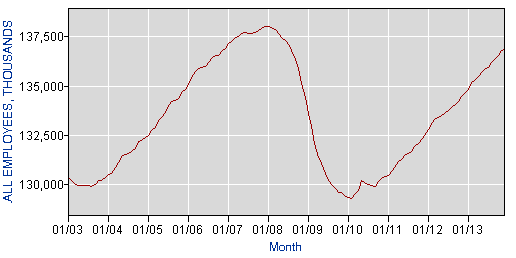 And those jobs have recovered agonizingly slowly since the official end of the recession. Adjusted for seasonal variations, U.S. payrolls shrank by more than 8.7 million jobs between their peak in January 2008 and their trough in February 2010. Since then, the economy has regained fewer than 7.6 million payroll jobs. It wasn’t always thus: As recently as the 1980s and 1990s, annual growth in payroll jobs frequently topped 2% or even 3%. But that ended with the dot-com recession around the turn of the century. Since then, even the strongest years of payroll growth have been below 2%. That lackluster growth could be one reason why fewer Americans identify as middle class — and why President Obama is expected to make the economy and jobs key components of tomorrow’s State of the Union address.